Jayne Park got an asphalt trail and a small overlook and not much else for $300k. What could you do, what would you do, with $300,000? If you were fortunate enough to be given nearly a third of a million dollars you'd be able to purchase one extremely nice house. Or two very nice houses. That money would put as many as 6 people through a local four year private university or 12 people through a four year state university. Those hundreds of thousands of dollars would open a potential purchasing window for a dollar-wise person that could be life changing. The Paul Dyster administration accessed $300,000 in a combination of grant money and taxpayer cash that was directed - dumped is a more accurate term - into what Mayor Dyster and his planner, Tom DeSantis, named the Jayne Park Restoration Project. The root word of "restoration" is "restore" as in to bring back to its original condition. What Dyster and DeSantis did to the small, but verdant, Cayuga Island park was anything but restorative. The now infamous "Jayne Park Plan" cut a ten foot wide asphalt trail through the virginal green space for a half mile. That simple act of destruction removed 35,000 square feet of prime topsoil from Cayuga Island and transferred the soil into the hands of the Dyster preferred contractor that cut the asphalt pathway. The "restoration" plan constructed a cheesy "overlook" platform on the shore of the Little River that Mayor Dyster had the temerity to comically pass off as a multi-dimensional viewing platform, fishing platform and bird watching platform. 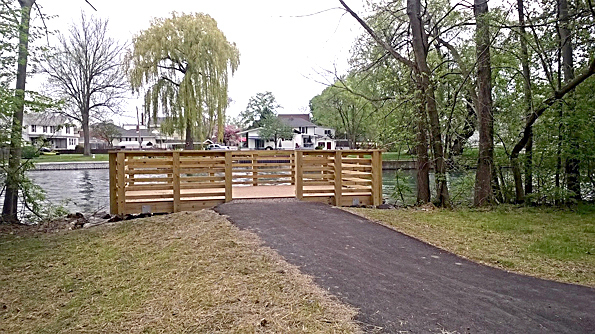 The facts are that before the platform was built a person so interested could fish from anywhere along the river bank and could carefully, discretely, enjoy bird watching at the eastern end of the Cayuga Island park. The Dyster restoration plan didn't stop there as it placed a few metal trash cans and matching metal benches on the "asphalt trail" along with a dozen or so 8 to 12 foot trees and a handful of 7 foot shrubs. A recent inspection of those trees revealed that some are already suffering with dead or diseased limbs under drought-like conditions caused by simple neglect...the striplings aren't being fed, watered or groomed. The plantings are evidence of the "drop, stop and go" method of landscaping so often seen in government landscaping jobs. That is, the plant is dropped in the ground, the work and care stops right there, and the project goes forward with no looking back. Over in the Jayne Park play area the "restoration" took the form of dumping what we estimate to be 7,500 square feet of chipped dead Cayuga Island trees beneath the swings and play equipment. While state recreation guidelines call for a rubber mat or shredded rubber to be placed under swings and play equipment Dyster went with roughly chipped and dangerously pointed wood chips. The Reporter recently made an inspection of the playground and discovered that some of the wood fragments are longer than four inches with sharp points. Nit picking? No. State guidelines were ignored and the suspiciously "quick and dirty" treatment of the playground safety elements are plain to see. An asphalt path, a chintzy "overlook," a dozen struggling trees, a child "play area" totally out of tune with contemporary safety code and you have the "Mayor Dyster and Tom DeSantis Jayne Park Restoration Project" for a cool $300,000. That's OK, it's only taxpayer money. But think of how the average taxpayer could have used that $300,000!